Żurek, also known as biały barszcz (white borsht), is a traditional Polish soup whose signature tang comes from a base made from rye flour and water that's been left to ferment in a warm place over several days. This base is called zakwas in Polish, and basically is just a very watery sourdough starter. Growing up, this had always been one of my favorite Polish soups, and the changing of the seasons has inspired me to make żur from scratch. Many Polish delis will sell either ready-made zakwas in bottles (sometimes labeled as "biały barszcz") or powdered biały barszcz/żurek, which you can use as a base instead of going through the 3-6 days required to make homemade zakwas. You'll still get a good product, but you won't experience the same sense of satisfaction. Fermenting is fun! There is some controversy over what exactly the difference, if any, between żurek and biały barszcz is. I, and many others, use the terms interchangeably, although my family more commonly used the term żur or żurek (diminutive of " żur.") My father claims that żurek is always made on rye flour, while biały barszcz is made on whole wheat flour. 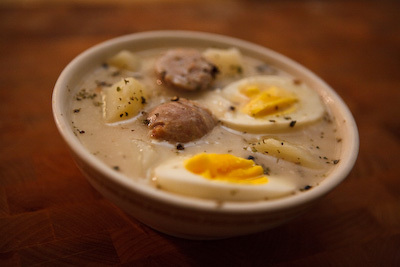 The Polish Wikipedia page on the soup agrees that a segment of the Polish population uses this naming convention, but others say that żurek is a soured Lenten/Easter soup that's served with potatoes and eggs, while biały barszcz is sour soup that's cooked with bacon and sausage. For all practical purposes, these two names are interchangeable, and there are countless variations on the soured rye base. Also, for those linguists in the house, it appears that the name żur comes from the same root as the German word sauer. 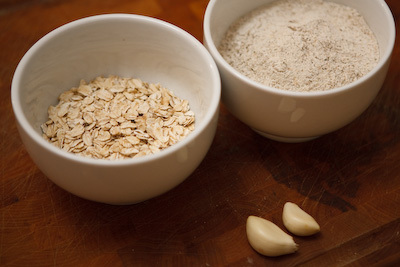 Rye flour by itself is perhaps more commonly used, but I like the combination of rye and oats. You can also use whole wheat flour, and rye or wheat bran, according to Polish sources I've consulted. Mix all of the above ingredients into a jar or stoneware crock with about 3 or 4 cups water that has been boiled and cooled (to evaporate the chlorine) to room temperature or slightly warmer. At this point, the crust of two slices of rye bread is customarily added to help the fermentation along. I added a tablespoon of sourdough starter, instead. Both ways will work, and the former is the way my mother and Polish mothers everywhere used to make it. Place your jar in a warm, draft-free location. You're looking for a temp of 70-80F ideally. 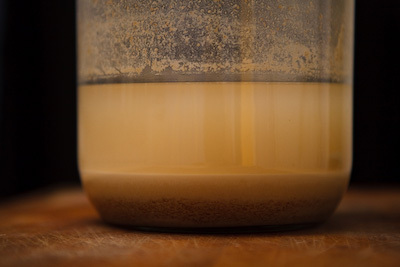 In about 24-36 hours, you should notice some bubbling in your starter, as well as a sweet-sour smell. If you know the scent of lactic bacteria (as in naturally fermented sauerkraut or pickles) that's what you're looking for. For this reason, it may be worthwhile to ferment this in the basement, near the furnace, so the smell is isolated. Personally, I love the smell so I just leave it in the kitchen. The zakwas should be ready to use in 3-6 days, depending on what level of sourness you desire. I used mine after 4 and felt it could have gone another day or two. My girlfriend, however, thought it was more than sour enough at this point. Use your discretion, and taste it from day to day. If you're using the crust of rye bread, remove after two or three days to prevent mold formation. Bring to boil, reduce to simmer, and cook for 30-40 minutes over low heat. In another pot, hard boil your eggs, and boil up some peeled potatoes that have been cut into quarters or diced into cubes. Bring to boil and cook until the raw flour flavor has cooked out, about 5-10 minutes. To serve, arrange boiled potatoes and hard-boiled egg halves in a bowl. Ladle the żurek over, making sure you get some sausage pieces in the bowl. For me, threr's basically two main divisions: those made with smoked meats, and those made without. If you prefer to make the recipe on smoked meats, follow the same recipe as above, substituting either Polish deli smoked ribs or smoked Polish sausage for the white sausage, and I encourage you using bacon as your base fat if you're going this route. Last edited by Binko on October 12th, 2008, 4:09 pm, edited 2 times in total. Excellent walkthrough, cultural context, and images. I'd love to make this. Come to think of it, I'd rather have you come over and make it. Anyplace out in the restaurant world that serves something the way you like it, if I don't have prep / kidnapping time? Santander wrote: Excellent walkthrough, cultural context, and images. I'd love to make this. Come to think of it, I'd rather have you come over and make it. 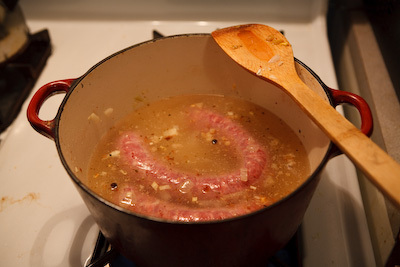 Around here, I like Szalas's zurek (they make it, if I recall correctly, as the recipe above, with bacon as the fat). To be honest, though, I don't really go to Polish restaurants very often, since I could always just go to Mom's for that. I should say, do not be afraid to use the packets of barszcz bialy or zurek if you don't feel like fermenting for the better part of a week. You might also find a bottle of something like this at your local Polish deli. This zakwas is available at Bobak's, but labeled simply as "bialy barszcz." Also, I should add that Polish red borscht is often made with pickled beets that undergo the same type of fermentation process as the white borscht described above. Instead of rye flour, you use beets cut into thin slices, mix them with water, garlic, and a couple rye bread crusts, and let them sit for about a week in a warm place. Maybe sometime in the winter I'll find the time to do the pickled beet borscht recipe. Last edited by Binko on October 10th, 2008, 10:15 am, edited 1 time in total. Great work Binko. Looks hearty and delicious. Binko wrote: Żurek, also known as biały barszczt (white borsht), is a traditional Polish soup whose signature tang comes from a base made from rye flour and water that's been left to ferment in a warm place over several days. Though I've only had Zurek a few places, Podhalanka being my favorite to date, there is something about the hearty sour soup that speaks to me. I can't wait to make Zurek using your wonderfully detailed tutorial, though in the meantime Szalas is calling my name. Glad everyone is enjoying the recipe! Meanwhile, I just realized I didn't offer a pronunciation guide. Roughly, Żurek is pronounced "ZHOO-rek," zakwas is "ZAH-kvahss," and biały barszcz is "BYAH-wih BARSHCH (or BARSCHT is easier.)" Binko wrote: Glad everyone is enjoying the recipe! Meanwhile, I just realized I didn't offer a pronunciation guide. Roughly, Żurek is pronounced "ZHOO-rek," zakwas is "ZAH-kvahss," and biały barszcz is "BYAH-wih BARSHCH (or BARSCHT is easier.)" Bless you, Binko - I'm forever getting blank looks from my friend of Polish descent when I talk about things I've read on the forum. My American interpretation of the spellings is obviously ridiculous. This looks great. I can't wait to try it myself! Perfect! That is the soup! The photos with the egg and sausage are exactly what it should be. Thanks for this post, Binko. You said: "At this point, the crust of two slices of rye bread is customarily added to help the fermentation along. I added a tablespoon of sourdough starter, instead." 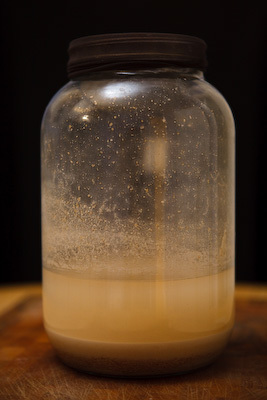 What do you use for sourdough starter? Is this something you can buy? And if so could anyone suggest a brand or source preferably in the north suburbs or anywhere? You say: "Many Polish delis will sell either ready-made zakwas in bottles (sometimes labeled as "biały barszcz")"
Here in the NW suburbs Niles Morton Grove area, I have seen the packages of powdered zakwas which seem to be readily available. But I have never seen zakwas in bottles. Can anyone suggest where to find the bottled zakwas, for us northsiders? Is it something that is available all year round or is it a seasonal Easter thing? Terrific post! I am tempted to try to make Żurek because I too love that sour taste. Way north in Cross Village, Michigan, the wacky but excellent Legs Inn makes delicious Żurek. I've had Podhalanka's, but it isn't as good. Thanks for the inspiration. 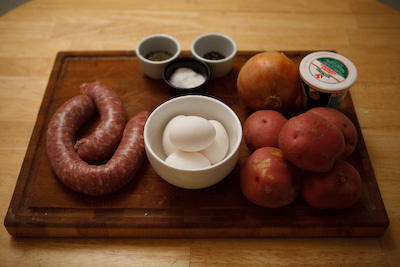 Most Polish soups don't have the egg, meat and potatoes visible. They are often opaque pools with the ingredients found as you dig in with your spoon. Is this presentation for our benefit or typical for your family? Do you also make Polish Pickle soup? I have a quart of pickle brine from pickles that I am keeping for this purpose. Do you have a favored method? Your post is very inspiring. Thank you for taking your time to present this to us. This is typical for our family, as we (and many Polish families I know) use rather shallow soup bowls. The sausage and potatoes would certainly be visible if you came over and had mom's zurek--actually even moreso than in the picture. Mom quartered her potatoes, while I cut them into cubes. We never used eggs in ours, but I like them, so I did arrange the eggs so their yolks would look a little sexier. Absolutely. I love Polish pickle soup. Basically, I just take a light stock, vegetable or chicken (although a smoked meat stock will work, too), mix it with shredded pickles (naturally fermented pickles, not vinegar pickles), shredded carrots, cubed potatoes, pickle brine to taste. Cook for a little bit, thicken with sour cream beaten with flour, and that's about it. Salt, pepper, allspice, and bay leaf as seasonings. Oh, and you can start it by frying a small onion or leek in butter. I don't always use onion/leek in my pickle soup. Garnish with generous amounts of dill. Glad you enjoyed it. 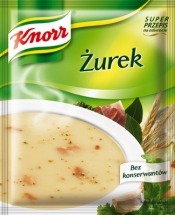 I saw Gary's post from awhile back about zurek, with him initially thinking it was based on sauerkraut juice (which, actually, is not really far off. Same idea: natural fermentation that results in lactic acid), so I thought it was be interesting to share how this mysterious soup is made. Thank you for unraveling mysteries one didn't even know where to begin to ask. My pickles are naturally fermented. I can't wait to make the Pickle Soup. There are not too many places that serve it. Joy wrote: You said: "At this point, the crust of two slices of rye bread is customarily added to help the fermentation along. I added a tablespoon of sourdough starter, instead." I have two sourdough starters in my fridge: one a typical San Francisco starter obtained by mail order, and another one that was passed down to me by a local chef. I've never seen anyone use sourdough starter for zurek--this is just something I assumed would work, since zakwas is just a very watery sourdough. (In fact, sourdough starter is called zakwas na chleb, or "zakwas for bread.") Some people reserve leftover zakwas to start their next batch, just like one would for sourdough. My mother's Polish cookbook only calls for rye flour and water for the zakwas, no rye bread crusts, so you should be able to get it going with just rye flour and water. I'm not positive as to the role of the crust, but somehow it's supposed to help and speed the fermentation along. I'm not exactly sure how or why, but you will find the addition of rye crust or whole slices of rye bread common in Eastern European pickling recipes. Apparently, they sell a special flour for zurek that looks like this. I've never seen it before, but it looks to me like a combination of rye and oats. Here's another picture of the flour in its packaging. "Ready 1 liter water, 20 dekagrams flour, clove garlic. Pour the flour into a stone pot or glass jar, pour over lukewarm, boiled water (~50C). Mix, add minced garlic, cover with cheesecloth, and leave in warm place for 4-5 days. When zur is pickled/fermented it has a sour taste and pleasant smell. etc." So those instructions, for instance, don't use any bread crusts at all. Rye flour is pretty easy to spontaneously ferment, so I would give it a shot. The one I've seen is Frubex brand, distributed by Lowell, and, like I said, I found it at Bobak's, so unfortunately, I can't help with the northside. I believe I've seen it in the refrigerated section, so you may want to check there. Cathy2 wrote: My pickles are naturally fermented. I can't wait to make the Pickle Soup. There are not too many places that serve it. I'll try to post an exact recipe sometime in the fall/winter. I'll see how my mom does it, and I'll see what her old Polish cookbook suggests. I'm pretty sure she makes it fairly simply, with just a light broth, pickles shredded on a box grater, pickle juice, and potatoes. I don't even think she adds sour cream. It's one of those recipes you can definitely build. 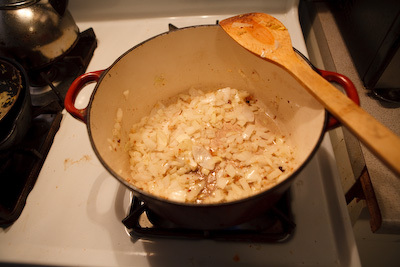 Just start with the broth and shredded pickles; taste; add pickle brine until you achieve your desired sourness. From there, you can decide whether you want sour cream or not. Whether you want shredded carrots, how thick you want to make it, etc. Coincidentally, a Polish chef just gave me a simplified recipe for white borscht. He recommended Cracovia brand zur concentrate. LAZ wrote: Coincidentally, a Polish chef just gave me a simplified recipe for white borscht. He recommended Cracovia brand zur concentrate. Ah, yes! I forgot Cracovia makes zakwas. It looks like this. You can use that or make your own, doesn't really make much of a difference in the final taste. Great post Binko, it's making me hungry already. 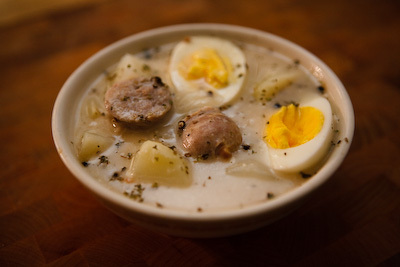 My Grandmother from Cracow used to make this soup using white sausage. It's always been one of my favorites. 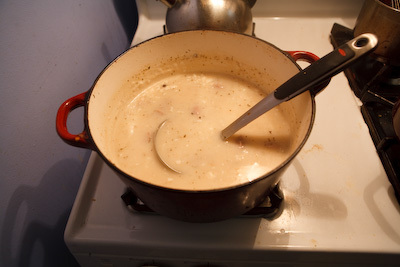 Mix potato water and sausage water in a large pot. Simple and delicious. Sounds like the sour cream and vinegar are meant to replace the fermented rye flour. We never had anything in ours, either, it was just broth. Perhaps a holdover fron my Grandma's depression-era upbringing? cybermud wrote: Sounds like the sour cream and vinegar are meant to replace the fermented rye flour. I would guess so. I've seen Polish Easter soup recipes where, instead of the fermented rye sour, they substitute vinegar, lemon juice, or even pickle juice. I like the gentle, lactic sourness of zurek, so I'm not a fan of vinegar as a substitute, but it will certainly work in a pinch. I seem to recall my mother occasionally spiking her zurek with vinegar when it wasn't tart enough for her tastes. In Chicago, where scores of Polish delis stock the bottled zur/zakwas, there's probably no reason to substitute vinegar. Binko wrote: Ah, yes! I forgot Cracovia makes zakwas. It looks like this. You can use that or make your own, doesn't really make much of a difference in the final taste. One of life's little mysteries solved - I knew this looked familiar; I'd seen it at Marketplace on Oakton and wondered what it was, and the other day, there it was, smiling down at me among the jams and jellies. I'd always assumed because of the placement, that it was some kind of vanilla paste - good thing I never tried to spread it on toast! YOU MAKE ME WANT TO RETURN TO POLAND! It's very similar to the one I've evolved, from several recipes I found online, after our trip to Poland a few years ago. After the wonderful Hubert Glinkowski of Glinkowski Carriages introduced my family to Zurek, I've been obsessed with it. I tasted it in every town in Poland we visited after that and had withdrawals upon returning home to NZ. After finding some (only TWO, at the time) recipes online, I started experimenting. Your recipes are closest to what I now use. I have always had sourdough starters (grew up in the SF bay area), and made one when I came to NZ. Noticing the smell of the kwas, or the zakwas, I realised it must be the same culture as my sourdough, so when I made my next kwas, I added a little sourdough. It worked, and a little faster. Just a thought re: your boiling to eliminate the chlorine, boiling also helps to eliminate other microorganisms that may be present, especially for those living with untreated water, such as we do (unfiltered, untreated river water) or bores (wells). While they may not be pathogenic, (disease causing), they may alter the flora growing in your culture, and you may wind up with very different results. I always make extra zakwas when I first make it, and keep a culture in the fridge. If it's too long between uses, scrape the yucky bits off the top and use a few tbs from the bottom to make your next batch. It can keep going for many years if you either use it frequently or keep replenishing by adding some more rye and water. Incidentally, I use kibbled rye rather than rye flour. Thanks SO much for your article. Spreading Zurek around the world. Well done.